Today, the Fifty-dollar Gold American Eagle remembers the foolhardy yet successful trick by Colonel John White on the night of September 30, 1779 in capturing 141 British soldiers along with five armed vessels. His success occurred just a few miles distant from Savannah on the Ogeechee river. One of the most extraordinary enterprises ever related in history, one indeed which nothing but the respectability of the testimony could have prevented our considering as marvelous, occurred during the siege of Savannah. It was an enterprise conceived and executed by Colonel John White, of the Georgia line. A Captain French of Delancey’s 1st battalion, was posted with 100 men, British regulars, on the Ogeechee river, about 25 miles from Savannah. There lay also at the same place five armed vessels, the largest mounting 14 guns, and having on board altogether 41 men. Colonel White, with Captain Etholm, three soldiers, and his own servant approached this post on the evening of the 30th of September, kindled a number of fires, arranging them in the manner of a large camp, and summoned French to surrender, he and his comrades in the mean time riding about in various directions, and giving orders in a loud voice, as if performing the duties of the staff to a large army. French, not doubting the reality of what he saw, and anxious to spare the effusion of blood which a contest with a force so superior would produce, surrendered the whole detachment, together with the crews of the five vessels, amounting in all to 141 men, and 130 stand of arms! Colonel White, however, had still a very difficult game to play; it was necessary to keep up the delusion of French, until the prisoners should be secured; and with this view, he pretended that the animosity of his troops was so ungovernable that a little stratagem would be necessary to save the prisoners from their fury, and that he should therefore commit them to the care of three guides with orders to conduct them to a place of safety. With many thanks for the Colonel’s humanity, French accepted the proposition, and marched off at a quick pace under the direction of the three guides, fearful at every step that the rage of White’s troops would burst upon them in defiance of his humane attempts to restrain it. White, as soon as they were out of sight, employed himself in collecting the militia of the neighborhood, with whom he soon overtook his prisoners, and they were conducted in safety for 25 miles to an American post. Thus ended the southern campaign of 1779, which had been attended with some daring and brilliant projects on both sides, but which closed with the balance of advantage greatly in favor of the British. The prospects of success to the Americans had been frequently flattering, but they were in everything baffled at the moment when victory seemed to be most certain. The defeat of Howe, which commenced the campaign, the subsequent disgraceful flight of Ashe, with a large detachment of the enemy, and the repulse of Lincoln from Stono, and the unsuccessful issue of the siege of Savannah, were counterbalanced only by the preservation of Charleston, and the continued possession of the upper parts of Georgia. 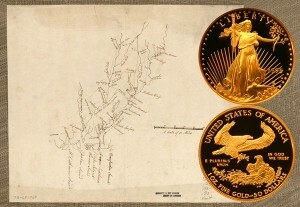 The Fifty-Dollar Gold American Eagle shows with a map of the Ogeechee and Savannah rivers, circa 1780s.